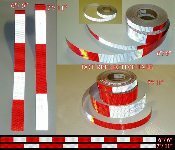 1" x 150' rolls of 5-7 year rated (V92) or 10 year rated (V82) DOT conspicuity tape available in the popular 7 inch white by 11 inch red pattern, 6" white by 6" red pattern or solid white. Both tapes exceed DOT and FHWA requirements. V82 is about 50% brighter than V92. All Reflexite DOT tapes are manufactured as a single layer and WILL NOT delaminate like other brands. We carry both the 7/11 pattern, the 6/6 pattern and in solid white rolls in the 5-7 year V92 line as well as the 10 year V82 line. The picture below shows the difference in the 7/11 and 6/6 tapes. Both patterns are DOT compliant. Make your selection above using the drop down menus. All rolls on this page are 1" x 150'.